Pretty obvious that this is a dirt road leading to a stone sculpture. But since that doesn't make much sense, l believe that this is a road leading up to a door that leads to an underground,.....house, l guess. Bottom image spotted this face on the hill, and after computer enhancement, saw that it was a face, a female grays face no less. Doesn't look like an Independence Day, ready to knock us off, evil face to me, quite the opposite. We need to stop watching Hollywood movies, except "The Day the Earth Stood Still", (the first one, not the demented second one) and Close Encounters l guess. 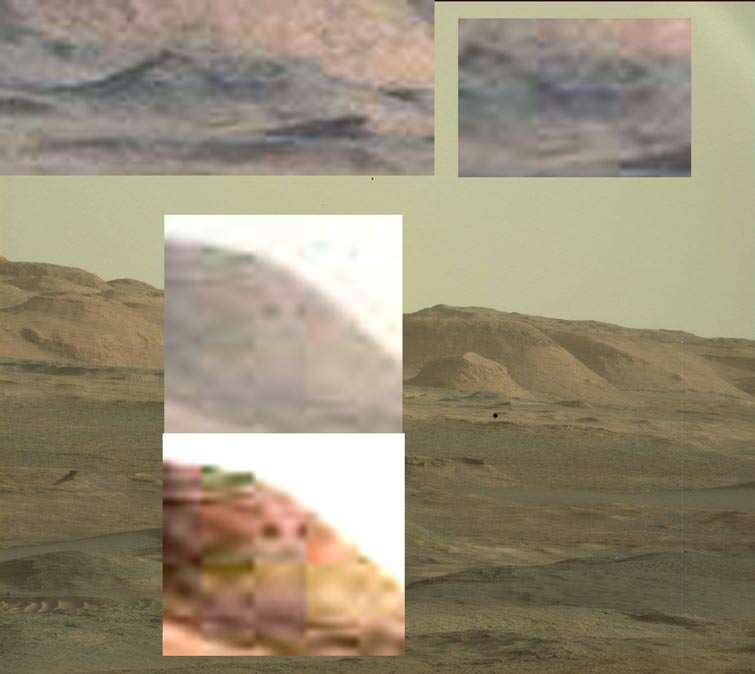 Hadn't realised that Joe at Art Alien TV has started modelling some of the artefacts identified in Mars images. Great idea - until we get there, it's a lovely way to feel closer to those objects. 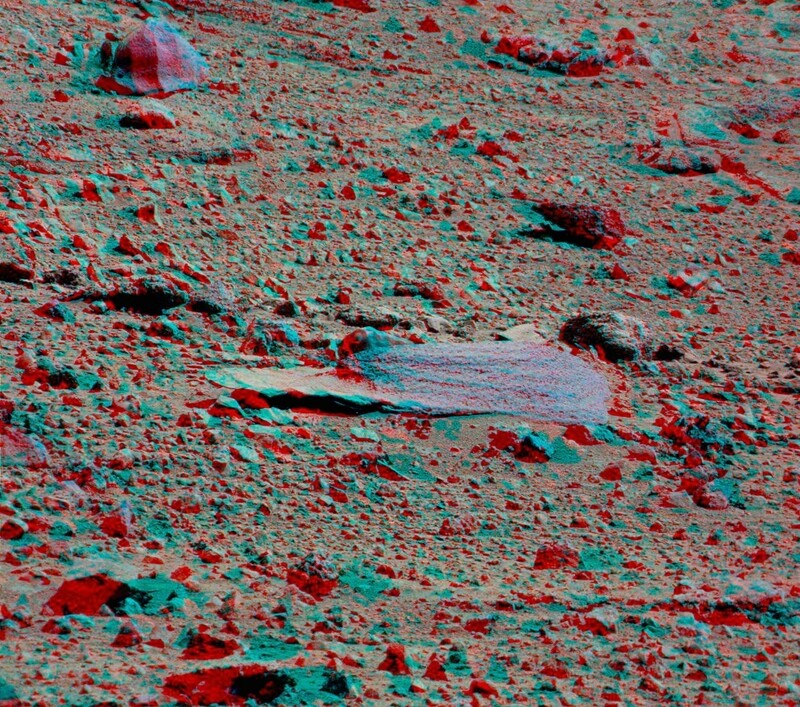 Really, NASA should be able to do this more accurately using lasers and stereoscopic images. 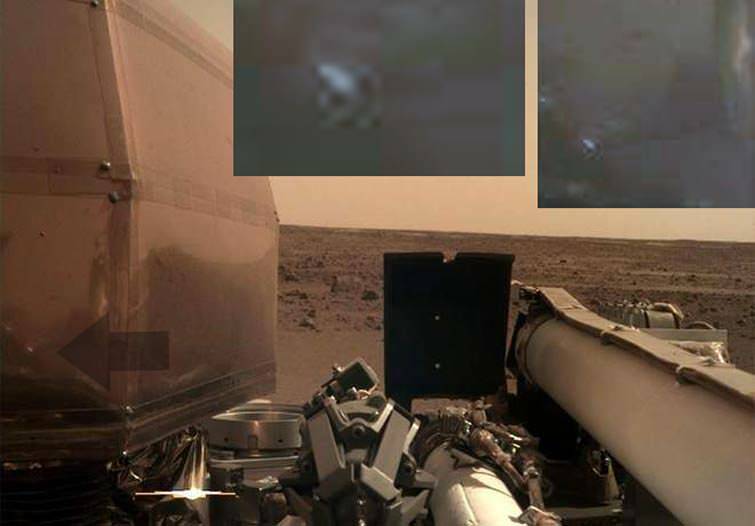 Top part is showing the rover, (black square) and a few plants. 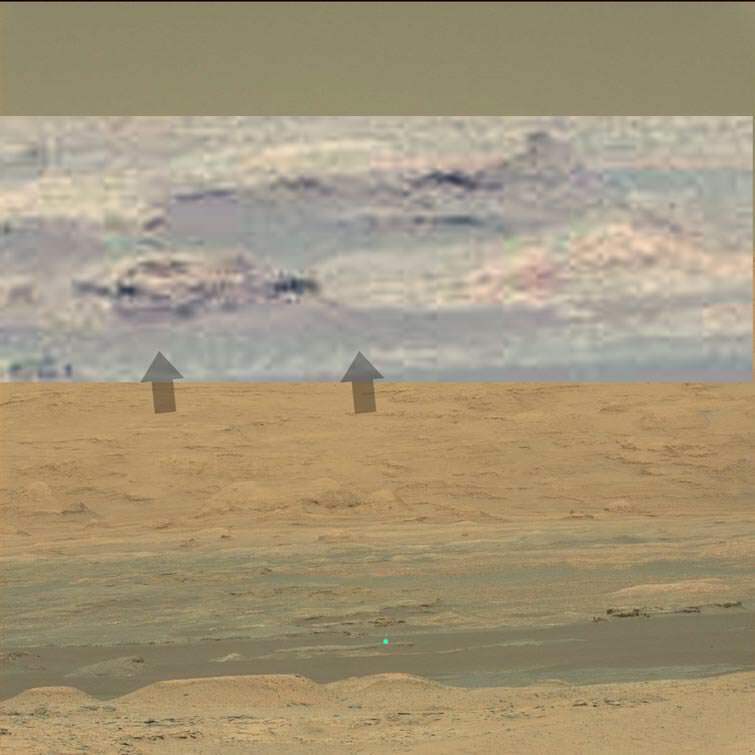 Bottom is showing that the sky is still overcast, and that the landscape is an obvious green. The martian sun is still setting over the green landscape with the occasional dark/tall thing, or a tree with blue hills behind. 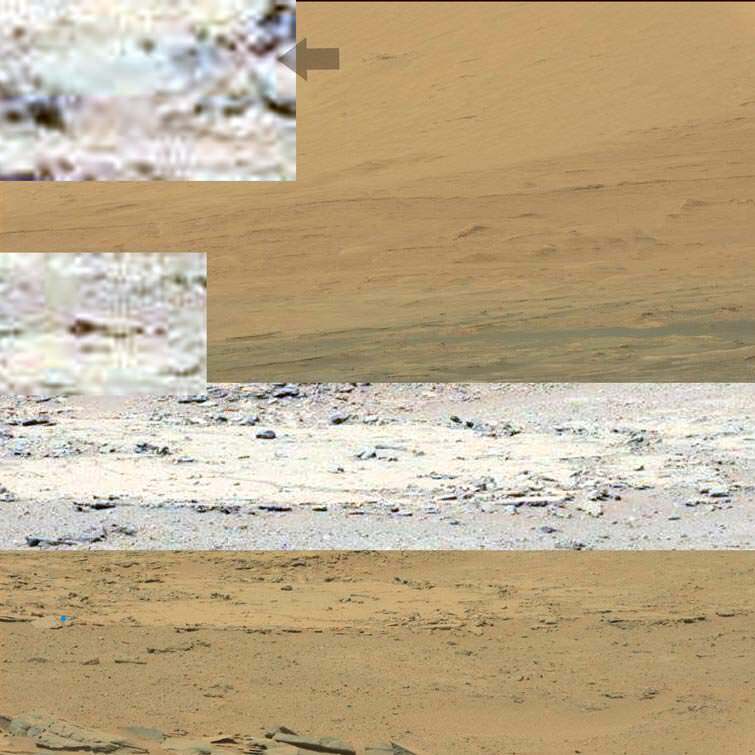 Always great to see your images Tmcom although I wish we could see better detail in these artifact ridden images from NASA. I just can't get over the fact that we send a multi million dollar lander to the planet's surface and from a meager distance of only several meters, we receive these "blurry's"....really? Are we to believe such fibs? You will be amazed by the number of people out there that will buy any silly idea to explain something. One of Musks rockets with an elite communications satellite on board gets blown up on the launchpad, with fast drones whizzing past, with heat weapons, (obviously not one of ours) but NASA says that it was a bird breaking the sound barrier, eventhough the fastest speed is around 200km/s, (you need 700). 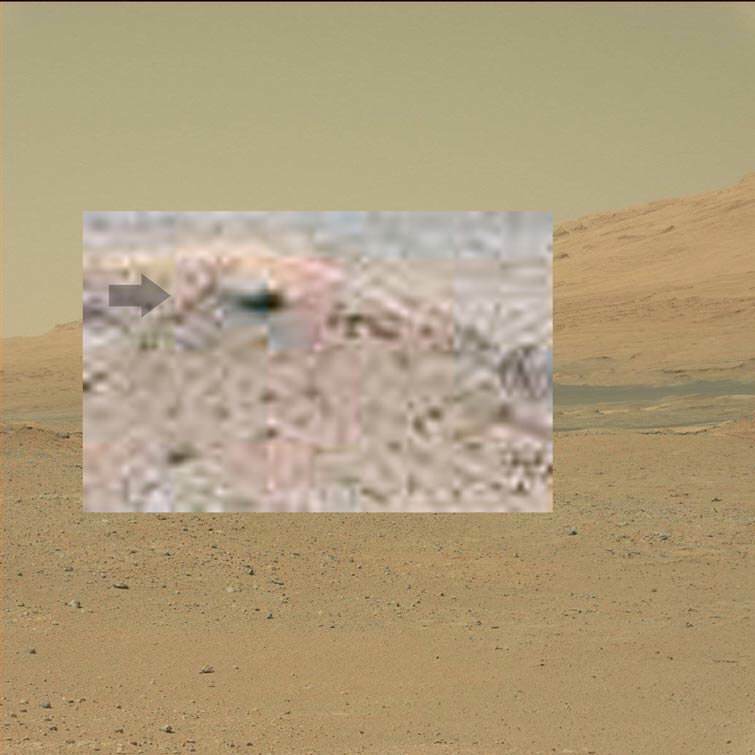 NASA has issues with red filters on Mars, eventhough this doesn't occur anywhere else!!!! A UFO following the Apollo astranuats on most of their missions is one of the SLR panels, eventhough the 1969 mission was confirmed, (the 4 panels) to go into earths orbit and burn up. Some just refuse anything that confirms a coverup or worse an alien presence, even to the point of insanity, but we have to go by the evidence, especially this sort of thing. I can promise you that if l took the water drop, rover images, and wet dirt, (both of which are impossible) and clearly show earth like air pressures and rain, elsewhere, l would find fear, anger and incredible stupidity on others part. Or things like, "your evidence isn't what l consider evidence" or attacking the poster, but very few intelligently discussing the subject or worse agreeing with the evidence. Thankfully about 70% of the US population know that mars is earthlike, but are waiting for NASA to cut the crap and show us; the remaining 30%, don't know, but some are clearly completely brainwashed, and will never accept it. Least til they get HD image in their faces, which is inevitable. A 12 year old kid with a $100 dollar telescope can prove that mars has an atmosphere, blue sky and green, when mars is in range, but the adults with the 5 year old mentality will go with what NASA says. 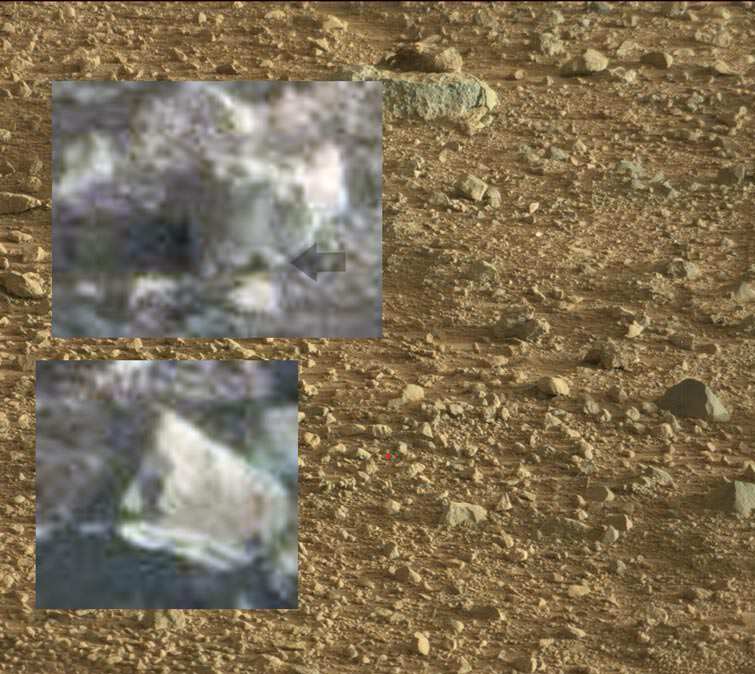 Mars rover being reflected back or a temple? I like the Martian temple idea. The sun is still setting but these are the last of the Sol 590 images. Bottom setting sun and plant, top, l would normally say dust devils, but these things look more like tornadoes to me. We know now that Mars air pressure and temp's are comparable to Earths, desert areas, but it would be pretty freaky weather if tornadoe's are common. Unfortunately a rock is my answer, but still interesting. I watched the vid and do agree it's a rock. I'm sure now that most all researchers have spent time on trying to find similarities in shapes which are familiar to Earth human designs and constructs. In order to find the alien mind, we need to step away from "the familiar" and look for anything which is different to Human creations. They are there but a mind warp is required and try to focus on "holographic creations". In that case, the mind will be "blown". My challenge for this forum, will there be any platform for discussions in this arena? Sunset, (lower part) and either mist or a lake, (l am going with a lake because of the sun glistening off of it). 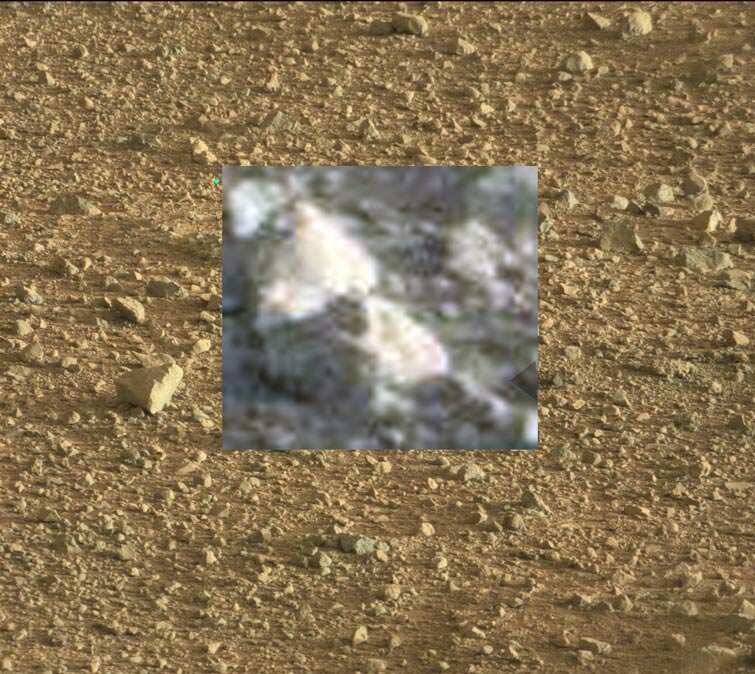 First image of the Sol 590 series. 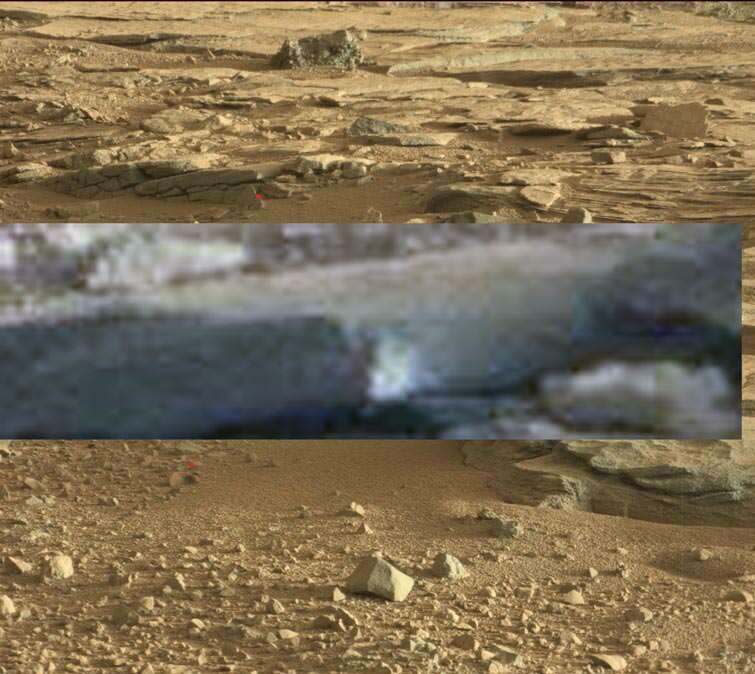 This doesn't look like the rover, (left). Nor does the thing on the right that looks like a water jet. Is the blue dot just an artefact of processing? I would have loved to say that this was something artificial, but it is only the rover trudging down a hill, and throwing some dust about. PS the blue dot is me being tired, and marking my discovery for later processing. But what are the chances of a rock having everything so arranged so perfectly: eyes, nose, arm, torso, headpiece. 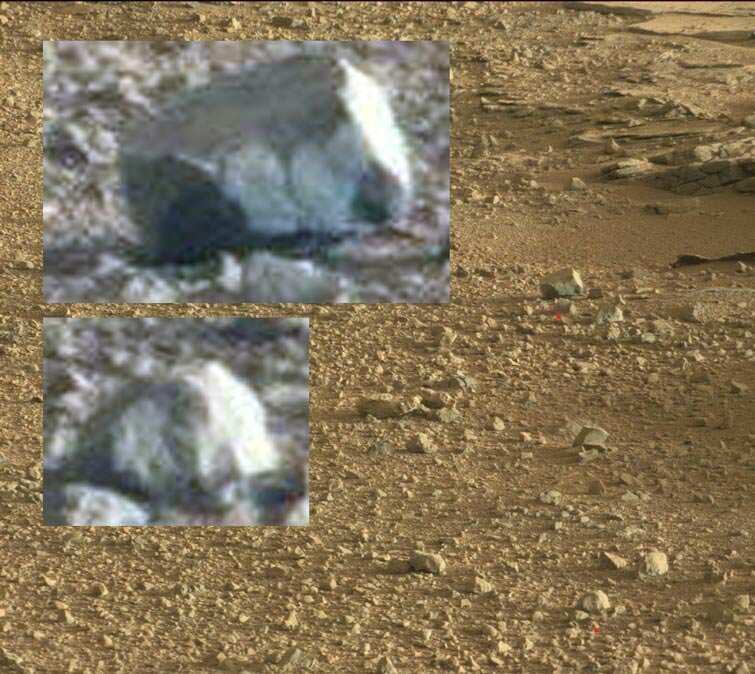 This isn't the only such object to be found, so I think we have to take these claims seriously and look into them. And another great find starts this video - appears to be a repitilian-like cranium. Who knows? Who goes, knows. Not sure what this is, but it doesn't look like the rover, or the buildings behind it. Top, some more of these weird structures, and lower, l was trying to figure out if this was dirty water, it is, (the image above it gave it away or the reflection). Why don't you put in those red markers you had a few posts back? Without them it's really nigh on impossible to make head or tail of your pics. Ok, Louis, point taken, l will use red from now on, (or at least a color that stands out). This really needs to be properly investigated. It might have to wait till we get there. Just a note to members elsewhere, if l post the "M" and a winking smiley face, that means that l am going to post something related. etc here. So this is related to First Man, when the apollo module gets released from the command module, and the 4 panels holding those stages together gets flung off. NASA and Buzz both claim that these 4 panels kept pace with the command and lunar module, but this movie, which was painfully accurate and realistic showed the command module moving away into space with no panels keeping pace at all. In fact the 1969 mission, the 4 panels went into Earth orbit and later burned up. 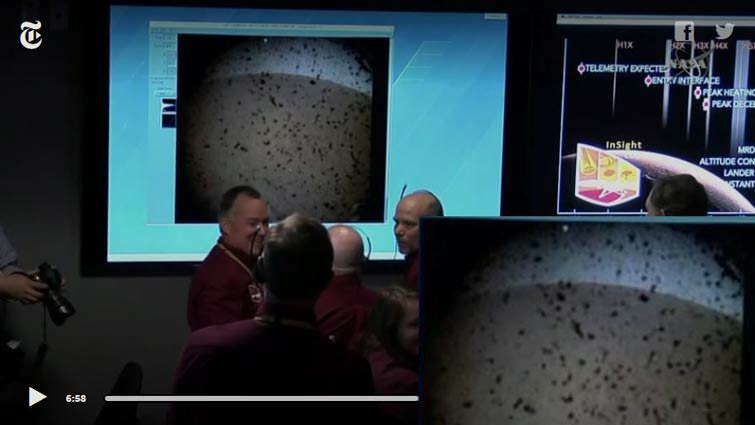 Apparently when some go and see this after reading this....http://newmars.com/forums/viewtopic.php?id=8020 they may finally realize that this is a legitimate UFO, and NASA, etc were lying. 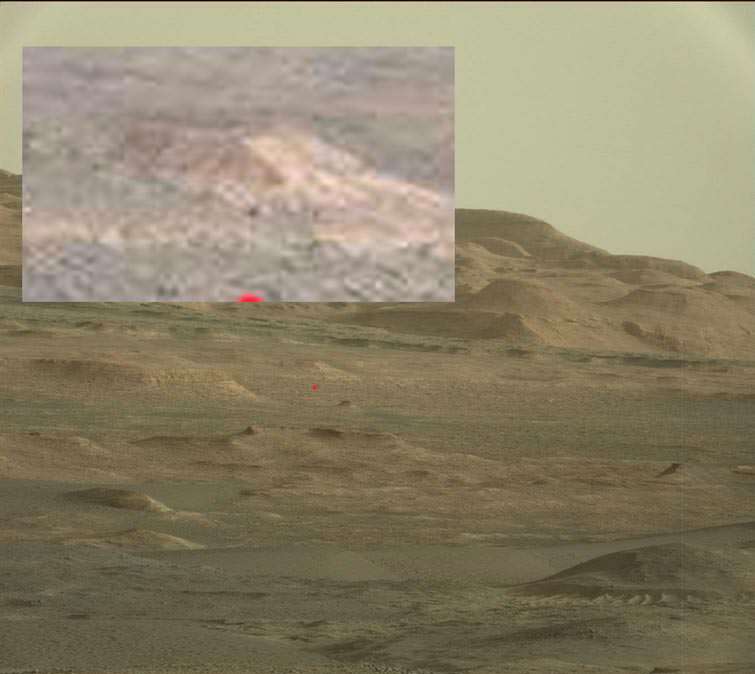 Nothing new to us we know NASA is lying about Mars, and it is second nature to them. But some tend to spit the dummy, and give you the cold shoulder, when proven wrong, which l find pretty funny. Finding out the truth should be the main motivating factor, not l am an emotional dependent on the herd mentality. Nope the dumb red/orange filter is back, as is the low res, for the next one. 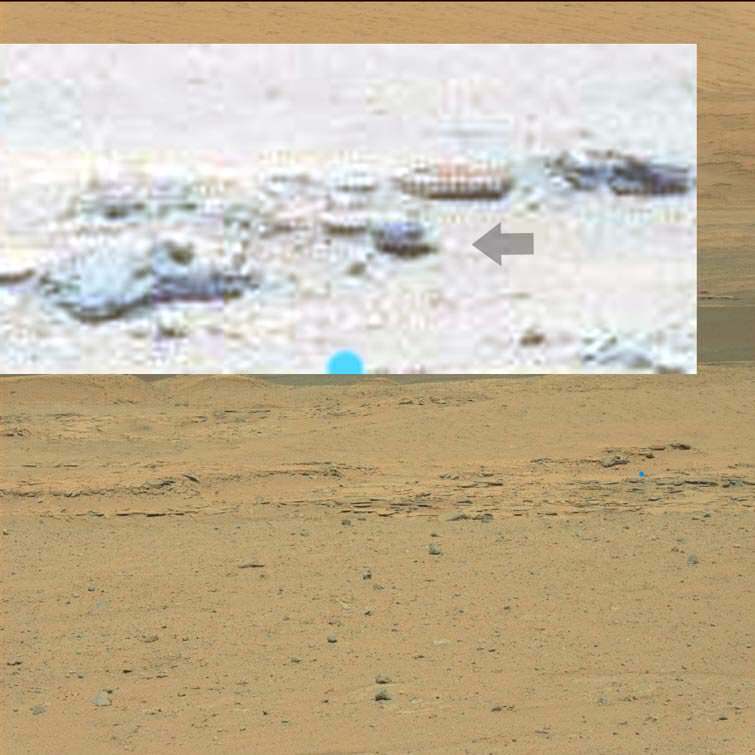 Although the silver thing sitting in the distance, (and possibly in the air) are most likely martian UFO's, reflected of the lander. I've certainly read - and I think this is NASA's position - that (in reverse to Earth) the sky tends to be blue at dawn and twilight but reddish during the day.